After the tumultuous events along the border between Venezuela and Colombia this weekend, resulting in humanitarian aid trucks being set on fire as they attempted to cross the Tachira River separating the two countries (with Juan Guaido supporters blaming pro-Maduro forces and vice versa), it appears Washington is prepared to set greater action in motion. Reuters reports on Sunday that US Vice President Mike Pence will announce “concrete steps” and “clear actions” regarding the Venezuela crisis during a meeting of Latin American heads of state in Bogota, Colombia on Monday, according to a senior administration official. Self-declared and US-backed opposition leader Juan Guaido announced Saturday evening he would attend the Lima group summit — a meeting of 12 American states which have recognized him as "legitimate" leader of Venezuela — despite the Maduro government placing a travel ban on him. 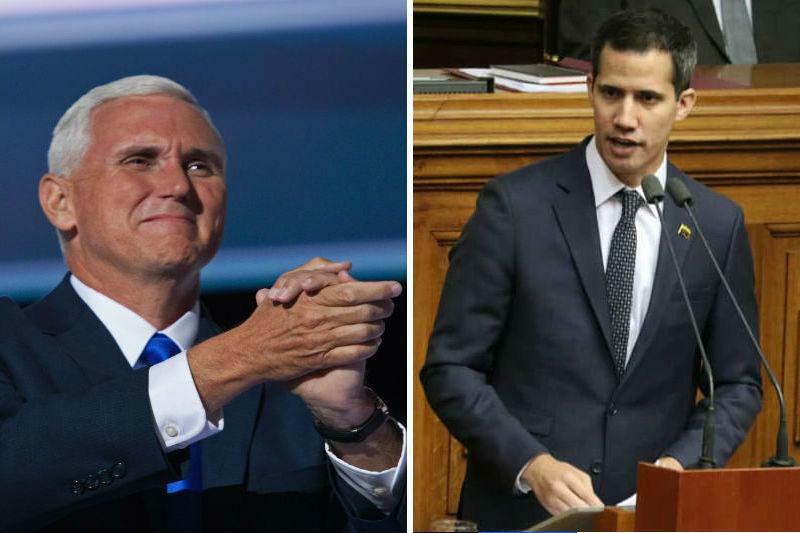 Guaido is to meet with Pence at the summit where the opposition head will “propose formally to the international community that we should keep open all options for the liberation of our homeland, which is fighting and will continue to fight,” according to a tweeted statement Saturday evening. Guaido has since Friday evening been addressing the opposition from neighboring Colombia, where he personally attempted to lead failed attempt at seeing an aid caravan across the border into Venezuela. He's also repeated calls for Venezuela's armed forces to defect, promising amnesty for any officer accused of corruption. Pence's speech to the Lima organization is set for around 10:30 a.m. ET (1530 GMT) following his planned meeting with Guaido, according to Reuters. The Reuters source declined to give further details on the content of the speech, but we can expect there to be plenty of echoes of Secretary of State Mike Pompeo's hawkish rhetoric first issued on Fox Business Sunday, as well as the introduction of new sanctions. Discussing the prospect of military action against Caracas, Pompeo said on Sunday morning that the Maduro regime's days are "numbered" and that "every option" is on the table toward making that happen. “What happened yesterday is not going to deter us from getting humanitarian aid into Venezuela,” the official said on Sunday, speaking with reporters on condition of anonymity. On Friday, another senior U.S. official told reporters that Pence would be prepared to announce new sanctions at the Bogota meeting if the aid was met with violence. US administration officials have condemned the weekend violence that erupted amidst opposition-led efforts to bring in aid trucks from Brazil and Colombia, which US leaders blamed on “Maduro’s thugs” who are led by the “sick tyrant” Maduro for refusing to allow much-needed food and medicine to reach his own people; however, Caracas has reportedly allowed in hundreds of tons of Russian and other international aid of late. The Maduro government sees American "humanitarian aid" missions, which increasingly involve military transport planes landing in US ally Colombia airstrips, as part of broader efforts to foment coup. Indeed Pompeo's words on Sunday declaring that Maduro's "days are numbered" is an affirmation that Maduro's fears are not unfounded.